Lisbon is known for historic sites, zoos & aquariums, museums, nightlife, and classes. Your plan includes some of its best attractions: wander the streets of Belém Tower, shop like a local with Rossio Square, don't miss a visit to Praca do Comercio (Terreiro do Paco), and steep yourself in history at Castelo de S. Jorge. For traveler tips, ratings, maps, and tourist information, you can read our Lisbon tour itinerary planning site . Sao Paulo, Brazil to Lisbon is an approximately 14-hour flight. You can also do a combination of bus and flight. The time zone difference moving from Brasilia Time to Western European Time is 3 hours. Expect a bit cooler temperatures when traveling from Sao Paulo in April; daily highs in Lisbon reach 24°C and lows reach 13°C. Finish your sightseeing early on the 19th (Fri) so you can travel to Barcelona. Start off your visit on the 19th (Fri): pause for some photo ops at Casa Batllo, then appreciate the extensive heritage of El Barri Gòtic, and then pick up some local products at La Boqueria. On the 20th (Sat), you'll have a packed day of sightseeing: don't miss a visit to Basilica of the Sagrada Familia, stroll through Parc Guell, and then explore and take pictures at Camp Nou. To find photos, reviews, ratings, and more tourist information, read Barcelona trip planner . Getting from Lisbon to Barcelona by flight takes about 5 hours. Other options: drive; or do a combination of bus and train. Due to the time zone difference, you'll lose 1 hour traveling from Lisbon to Barcelona. April in Barcelona sees daily highs of 22°C and lows of 13°C at night. Finish your sightseeing early on the 21st (Sun) so you can travel to Rome. Rome is known for historic sites, nightlife, museums, classes, and shopping. Your plan includes some of its best attractions: explore the ancient world of Colosseum, get to know the fascinating history of Piazza Navona, make a trip to Trevi Fountain, and take in the architecture and atmosphere at Church of St. Louis of the French. To find photos, traveler tips, other places to visit, and tourist information, you can read our Rome road trip planner . Traveling by flight from Barcelona to Rome takes 5.5 hours. Alternatively, you can drive; or take a train. In April, plan for daily highs up to 24°C, and evening lows to 11°C. Finish your sightseeing early on the 23rd (Tue) to allow enough time to travel to Venice. Start off your visit on the 24th (Wed): take in the spiritual surroundings of Campo del Ghetto, contemplate the waterfront views at Canal Grande, snap pictures at Ponte di Rialto, then pause for some serene contemplation at Santa Maria dei Miracoli, then admire the striking features of Basilica di San Marco, and finally steep yourself in history at Ponte dei Sospiri. Get ready for a full day of sightseeing on the next day: admire the striking features of Scala Contarini del Bovolo, then make a trip to Peggy Guggenheim Collection, then take in panoramic vistas at St Mark's Campanile, and finally appreciate the extensive heritage of St. Mark's Square. For ratings, maps, photos, and other tourist information, go to the Venice trip planner. Traveling by flight from Rome to Venice takes 3.5 hours. Alternatively, you can take a train; or drive. In April in Venice, expect temperatures between 21°C during the day and 11°C at night. Finish your sightseeing early on the 25th (Thu) to allow enough time to travel to Berlin. 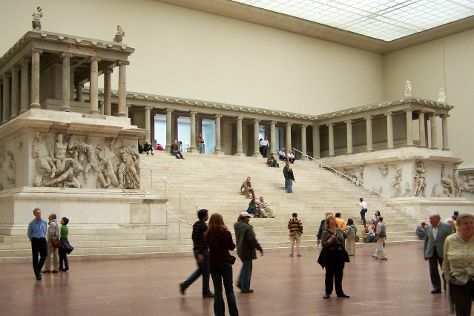 Start off your visit on the 26th (Fri): appreciate the history behind Brandenburg Gate, then appreciate the history behind The Holocaust Memorial - Memorial to the Murdered Jews of Europe, then get a sense of history and politics at Reichstag Building, and finally admire the masterpieces at Pergamonmuseum. For traveler tips, other places to visit, maps, and more tourist information, go to the Berlin trip website . Getting from Venice to Berlin by flight takes about 4.5 hours. Other options: do a combination of train and flight; or drive. Wrap up your sightseeing on the 27th (Sat) early enough to travel to Amsterdam. Amsterdam is known for museums, nightlife, parks, breweries & distilleries, and shopping. Your plan includes some of its best attractions: admire the masterpieces at Van Gogh Museum, steep yourself in history at Museum Het Rembrandthuis (Rembrandt House), wander the streets of Red Light District, and take an in-depth tour of Anne Frank House. 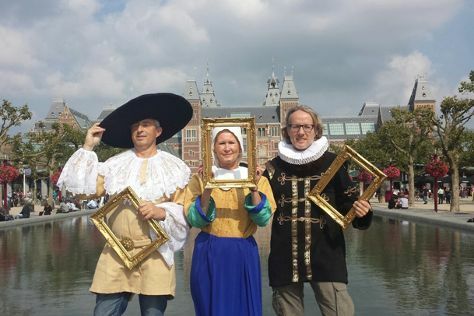 To find traveler tips, where to stay, more things to do, and tourist information, read Amsterdam holiday builder . You can fly from Berlin to Amsterdam in 4.5 hours. Other options are to do a combination of flight and train; or drive. In April in Amsterdam, expect temperatures between 15°C during the day and 5°C at night. Finish your sightseeing early on the 30th (Tue) so you can take a train to Paris. Go for a jaunt from Paris to Versailles to see Palace of Versailles about 48 minutes away. And it doesn't end there: steep yourself in history at Eiffel Tower, pause for some photo ops at Arc de Triomphe, admire the landmark architecture of Cathédrale Notre-Dame de Paris, and take in the architecture and atmosphere at Sainte-Chapelle. 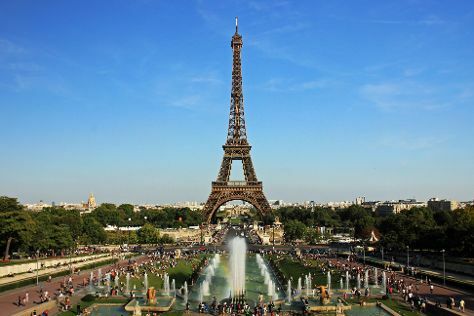 To see other places to visit, more things to do, and more tourist information, refer to the Paris trip maker website . Take a train from Amsterdam to Paris in 3.5 hours. Alternatively, you can fly; or drive. Expect a daytime high around 18°C in April, and nighttime lows around 6°C. Finish up your sightseeing early on the 4th (Sat) so you can catch the train to London. London is known for museums, nightlife, historic sites, shopping, and parks. Your plan includes some of its best attractions: admire the masterpieces at National Gallery, stroll through Hyde Park, step into the grandiose world of Buckingham Palace, and take in the architecture and atmosphere at St. Paul's Cathedral. To find ratings, other places to visit, reviews, and more tourist information, read our London trip planner . Traveling by train from Paris to London takes 2.5 hours. Alternatively, you can fly; or do a combination of car and train. The time zone difference moving from Central European Time (CET) to Greenwich Mean Time (GMT) is minus 1 hour. In May, plan for daily highs up to 19°C, and evening lows to 9°C. Finish up your sightseeing early on the 8th (Wed) so you can travel back home.